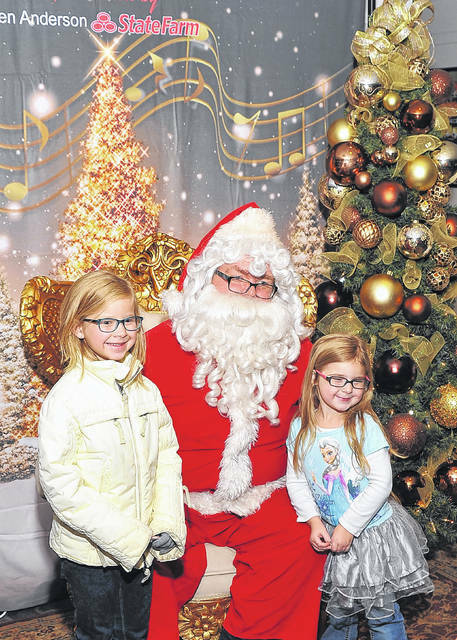 Athena Lutterbeck and Elianna Lutterback sit with Santa Claus during last year’s Flip The Switch in downtown Lima. LIMA — Santa and Mrs. Claus will make one of their initial Limaland appearances of the holiday season today in Town Square for the annual Flip The Switch tree-lighting ceremony, an event that serves as the unofficial kick-off to Lima’s celebration of the Christmas holiday. Ashley Williams, promotions director for iHeart Media/Mix 103.3 Radio, the event’s sponsor, said Santa is expected to arrive at about 5:15 p.m. and will be available inside the Civic Center lobby for photos to be taken with children. Activities at the fifth annual Flip The Switch event are primarily geared toward children, with a bouncy house and a “Sparkle Station” where youngsters can have glitter applied to their faces. Other stations will allow children to make Christmas cards and ornaments. Characters ranging from Buddy the Elf and The Grinch will be roaming throughout the square to interact with children, Williams said. All activities are free of charge. Food trucks will be available. Williams said one “lucky listener” of Mix 103.3 will be selected in a drawing to throw a switch and illuminate the large Christmas tree that has been erected in Town Square. Throwing the switch will also kick off non-stop holiday music on the radio station that will run from Friday until Christmas day, she said.